The name PSN J10435372+1140177 was assigned when Skvarc posted his discovery at the Central Bureau's TOCP webpage. Initial, underexposed spectra obtained by Ulisse Munari, Istituto Nazionale di Astrofisica, Padova Astronomical Observatory, on March 17.77 UT with the Asiago Observatory 1.22-m reflector (+ Boller & Chivens spectrograph) showed a very blue continuum, essentially featureless, with no absorption bands and no detectable emission lines, similar to a cataclysmic variable. Evolution of the spectrum to confirm the object as a very young type-II supernova discovered a few days after core collapse was seen in spectra obtained 1) by R. Itoh, T. Ui, and Masayuki Yamanaka, Hiroshima University, on 2012 March 19.5 UT at the Higashi-Hiroshima Observatory, Hiroshima University, and 2) by A. Siviero, L. Tomasella, A. Pastorello, S. Benetti, and U. Munari, Istituto Nazionale di Astrofisica, Osservatorio Astronomico di Padova, M. Ergon, J. Sollerman, and F. Taddia, Department of Astronomy, Stockholm University, and G. Barisevicius, Nordic Optical Telescope, on 2012 March 19.85 UT with the 1.22-m Galileo telescope (+ Boller & Chivens spectrograph) and on 2012 March 19.92 UT with the 2.5-m Nordic Optical Telescope (+ ALFOSC). Finder charts for SN 2012aw may be plotted using the AAVSO International Variable Star Plotter (VSP) at Http://www.aavso.org/vsp. 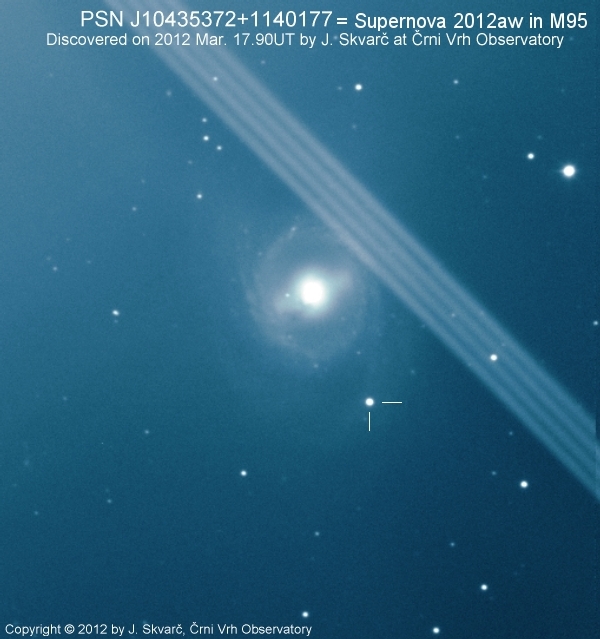 Please report observations to the AAVSO International Database as SN 2012aw.